This oil painting was painted on a rainy day in my otherwise scalding hometown, Vellore. Almost all of my oil paints had dried up and the only colors that seemed to have not fully turned solid in the many months I had left them to collect dust were vermillion red, yellow ochre, sap green, cobalt blue and a little bit of brown.I was immensely bored and fortunately in the mood to paint so I got creative with the last piece of chart paper left in my house. 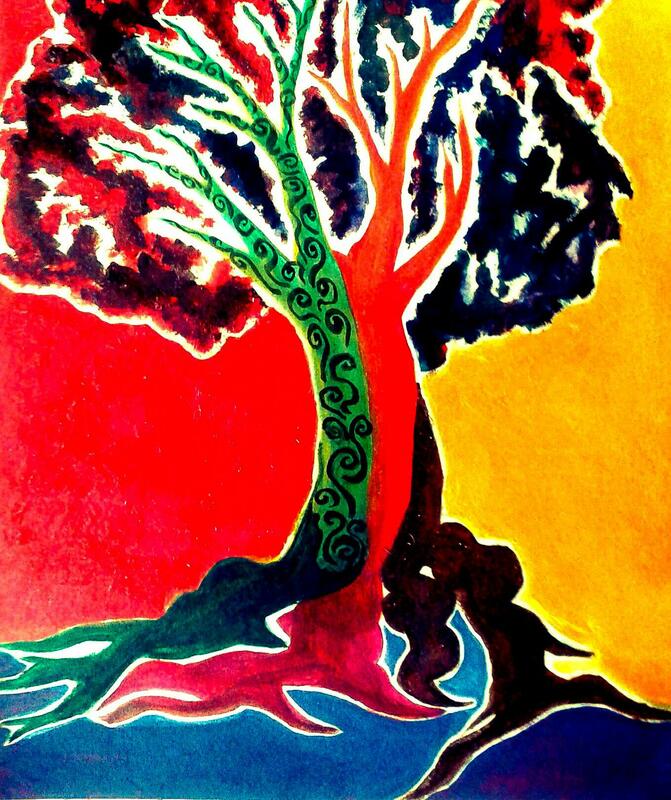 What started out as a few meaningless strokes finally ended up as a colorful painting of a tree suffused with ecological and philosophical meanings. I leave you to make the best sense of it. Betsy is a seventeen-year-old from south India. She is tall, lanky and obsessive. Her writing and art have been published or are forthcoming in magazines like Polyphony H.S, The Tishman Review, Inklette, Page & Spine, The missing slate and Moledro, among others.